Two media watchdogs have sadly given an affirmative answer to the question I raised in my morning post of March 27: Have two more journalist been killed in Syria? 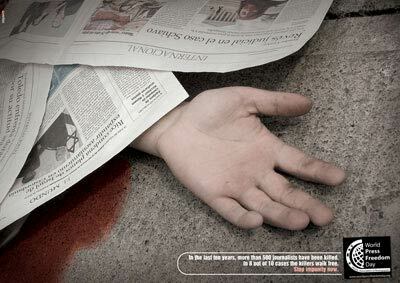 The first was the Committee to Defend Journalists and now Reporters Without Borders. Two freelance journalists, including a Briton of Algerian origin, have been killed at the Syrian-Turkish border, Reporters Without Borders said yesterday. "Reporters Without Borders condemns the killing of two freelance journalists who were shot dead after an attack by Syrian forces on a group of about 50 people trying to enter Syria at Darkush on the border with Turkey three days ago," it said in a statement. "Immediately after the offensive, the two journalists, aged between 28 and 32, were reported to have returned to the scene to collect their equipment. A Syrian army vehicle opened fire on them, killing both," it added. It said the tragedy occurred a day after the murder of Kurdish citizen journalist Jawan Mohammed Qatana on March 25 in Derbassiyeh, north of the eastern city of al-Hassakeh. “The lawyer and blogger Rudy Othman was among the new detainees. He was arrested on Hamra Street in Damascus on March 15 for the third time since the start of the protests. The blogger and activist Jamal al-Omas was arrested at the Lebanese border the same day as he returned from Beirut. Meanwhile, two Turkish journalists -– Adem Özköse, a reporter for the magazine Gerçek Hayat and the daily Milat, and cameraman Hamit Coşkun -– who have been missing in Syria for three weeks are being held by militias loyal to the Syrian army and are in good condition, their Syrian guide told Turkey’s Anatalia News Agency Thursday. “I was in custody with Adem and Hamit for 10 days before they released me. They are both alive, and they are fine,” said Baha’eddin Sharm, the Syrian guide. Sharm said around 50 Syrian militia detained him and the journalists on March 8 near the town of Binnish close to Idlib and kept them in Al-Fua village. Sharm said they were taken hostage at a house, where they were given bread and water, and added that some people believed to be members of the Syrian intelligence services had interrogated them. “They wanted to hand us over to Syrian intelligence, but they were unable to do that because the roads were blocked by opposition forces and they were afraid of losing us to them,” Sharm said. The two journalists had arrived in Idlib near the Turkish border to cover the violence and make a documentary, said Sharm, adding that the pair had asked him to guide them in the country.